Dan and Pat Arnold pose in their period-inspired outfits that compliment their pride and joy. The 120 was one of the car lines that helped Packard survive the end of the Great Depression. The car was designed to compete in the mid-priced auto market and be a lower cost option for entry into a Packard vehicle. The 120 Club Coupe featured a crowned instrument panel in silvery aspen wood grain with chrome trim. The speedometer had a translucent pointer indicating speed in red, amber, and green light, and the gearshift, which they branded as Handishift, was mounted on the steering column. The coupe had a 282 cubic inch, Straight 8 L-head engine. The 1940 model had a narrower tapered radiator with trim cooling grilles. The smart new fender lamps were a "Sealed Bean" system, with the lens, light source and reflector as a combined single unit. The head lamps also had the Country (high beam) and Traffic (low beam) functions. The Goddess of Speed was just one of Packard's iconic flying lady hood ornaments. The car had bigger balloon tires than previous models and had an exclusive fifth shock absorber for a smoother ride. The longer sleeker hood of the 120 was designed to enhance speed-stream styling and the greater length would allow for side mounting of spare wheels if the extra equipment was purchased. While automobile fans love it, other classic car owners lose a bit of luster when Dan and Pat Arnold come rolling up in their 1940 pride and joy. That’s because the beautiful candy white Packard often wins Best in Show wherever it goes. James and William Packard started a car company in Ohio and moved to Detroit, Michigan in the early 1900s to build their famous Packard factory. By the time 1940 came around, the model of the Packard had dramatically changed and became very attractive. The Arnolds’ got their hands on their classic in 1962 as Dan bought it from a coworker for $100. “I think there was a $3 sales tax,” he said with a chuckle. 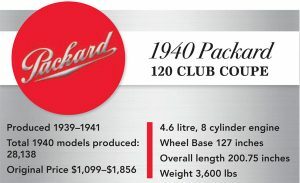 The Packard was constructed with a variety of engine types but the Arnolds are happy with their 120 straight 8. It is one of only 2,548 units of its kind and features a wood grain on the dash that is actually metal made to look like wood. It also has leather upholstery and the signature flying lady hood ornament. As a teenager, Dan was in love with the 1940 Ford Coupe and with some similarities in the style, Dan’s friend decided to show him his Packard. Standing six feet high at the center with a big V-shaped grill and chrome vertical bars, Dan had to have it. He drove the Packard for 12 years as a family car before moving to Meigs County and parking it in a barn. There, the Packard sat. Days became months became years and decades before Dan and Pat decided in the early 2000s to either restore it or get rid of it. Despite the dilapidation from time (and mice), the Arnolds decided on the former and worked along with a friend to start a restoration that would become a labor of love over a couple of years. The body was taken off the frame and sandblasted. Every part and piece of the vehicle was checked for originality. While Dan could handle most of the mechanical aspects, some of the other work had to be done offsite. When it came time for paint, Dan favored candy white but others balked because that was not one of the original colors offered when the 1940 Packard came off the line. Otherwise, this 1940 Packard is completely restored to original, right down to the pin striping on the wheels and around the window sculpture. When all was said and done and Dan first laid eyes on the car, “Wow” was all he could say. “It exceeded my fondest expectations,” he remembered. The Arnolds are part of the Packard International and the Buckeye Packard car clubs and are regular participants in area car shows. Locally, the 1940 beauty has appeared at the Cruise-In at the Convo in Athens and the Color in the Hills Car Show in Glouster. The interaction with people at car shows makes this labor of love worth all the work and Dan said the car receives Best in Show at just about every event. At age 77, Dan has owned more than 60 cars in his lifetime — some classic, others not — but this is the only one he decided to turn into a show car. It’s not hard to see that the Arnolds made a wise choice.